Fans of Gundam SEED‘s Athrun Zala should rejoice now. After Gundam Versus was released on PlayStation 4 with Kira Yamato, Yzak Joule, and Nicol Amalfi, with Mu La Flaga and Dearka Elthman recently added as DLC (and of course there the big bad guy Rau Le Creuset as well as two of the three Druggies available too), some may be wondering why Bandai Namco is intentionally ignoring one of the show’s most popular character who is Kira’s best friend. Worry no longer, as Athrun’s Aegis Gundam has just been finally confirmed to join the Gundam Versus roster as a DLC mobile suit. With an in-game cost of 300, the GAT-X303 Aegis Gundam comes equipped with a variety of armaments. Its primary melee weapon is Beam Saber and the main ranged weapon is a chargeable Beam Rifle. It can also throw its shield with the Sub Ranged attack command, while the Special Ranged attack will make it shoot the Scylla energy cannon. And its Special Melee attack command makes it transform into its MA mode, which can also grapple the enemy with its claws. Another separate DLC mobile suit will also accompany the Aegis Gundam when it’s going to be released on December 12. Those who have played a lot of Gundam games may be familiar with Master Pierce Rayer and his White Dingo squad, which actually first appeared in the Dreamcast game Mobile Suit Gundam Side Story 0079: Rise from the Ashes. Master will join the brawl too with a GM Sniper II customized for the White Dingo squad. This GM Sniper II comes with a low in-game cost of 200. Being a sniper, its main weapon is the Long Range Beam Rifle, which can be shot normally with the normal Ranged Attack command, shot with better precision with Special Ranged Attack command, and charged to full power with the Burst Attack. It is also equipped with Beam Saber as its melee weapon and Hyper Bazooka as a sub ranged weapon. Purchasing White Dingo’s GM Sniper II will also come with two new BGMs from the game that debuted them, Sharp Fangs and the eponymous Rise from the Ashes. 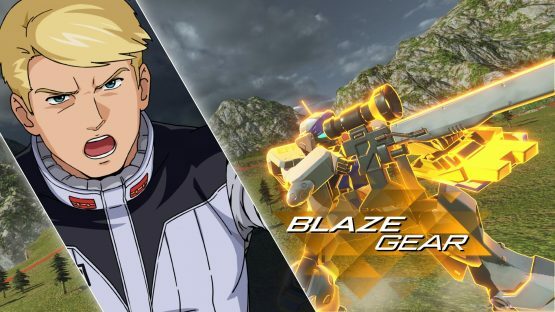 Bandai Namco has been on a roll in adding DLC mobile suits to Gundam Versus recently. Today they have just released Zeydra and Atlas Gundam, and we’ll also see a lot more mobile suits to be added almost every week consecutively; Raider Gundam and Gerhart Schmitzer’s Zaku I on November 28, and Gundam AGE-2 with Gundam Mudrock on December 5.